Founded in 2012 by Mike Bishop, Big Storm now has two brewing and taproom facilities in Tampa Bay. Led by Head Brewer, Joel Moore, Big Storm's innovative craft beers have received critical acclaim for the past five consecutive years, winning 2016's Best Florida Beer Championship with their Oktoberfest Marzen Lager. 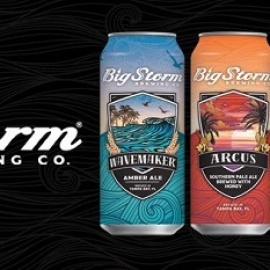 Today, Big Storm is a true pioneer using local ingredients like citrus and wild flower honey, brewing more than 20 different beers, including their popular Arcus IPA, Wavemaker® Amber Ale, Helicity® Pilsner and Oats in Hose Oatmeal Stout. Available in most local Publix, Whole Foods, Total Wine and ABC Liquors, Big Storm is not just craft beer, but great beer. 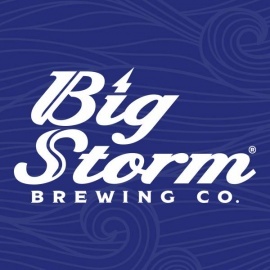 Big Storm Brewing Co is one of the fastest growing independent craft breweries in Florida.